alaTest on kerännyt ja analysoinut 89 arvostelut tuotteelle Denon RCD-N7. Keskimääräinen antama arvosana tälle tuotteelle on 4.0/5, verrattuna keskimääräiseen arvosanaan 4.1/5 kategoriassa Audiolaitteet. Me analysoimme käyttäjien ja ammattilaisten antamia arvosteluita, tuotteen ikää ja muita seikkoja. Verraten muihin tuotteisiin kategoriassa Audiolaitteet, Denon RCD-N7 on saanut alaScore™-arvosanan 89/100 = Erittäin hyvä. The Denon CEOL RCD-N73 is a CD mini system that will stream music over Wi-Fi from a handful of streaming services or your iPhone/PC. It's compact and versatile, and Apple's latest wireless tech comes built-in. Is this the Holy Grail of mini stereos? This is obviously an evolving market. If Denon RCD-N7 is an office solution, it is the most advanced one we've ever seen with Apple Airplay support, streaming, high quality five-way binding posts, and pre-outs for a sub and external amp. The trusty old CD may be on its way out, making way for a variety of streaming services from the cloud, but Denon's D-N7 multimedia system keeps the traditionalists happy with this mini Hi Fi system with matching speakers promising to be the white knight. 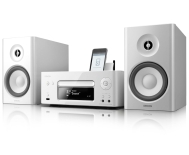 A finely tuned mini system with some superb features. AirPlay and other networking functions. Compact size. Good audio quality.